PureVPN is one of the largest and best-known VPN providers in the market today. Since launching in 2007, they have served over 1 million satisfied customers, and there's no sign of their popularity declining. So why do so many people choose PureVPN? It's no mystery really - not only do they offer a well-established product, but Pure are also one of the most affordable VPNs we've come across. Some other providers may provide more nifty features as standard, but the vast majority of users are looking for a secure, simple and easy-to-use network and on paper PureVPN certainly ticks all of these boxes. 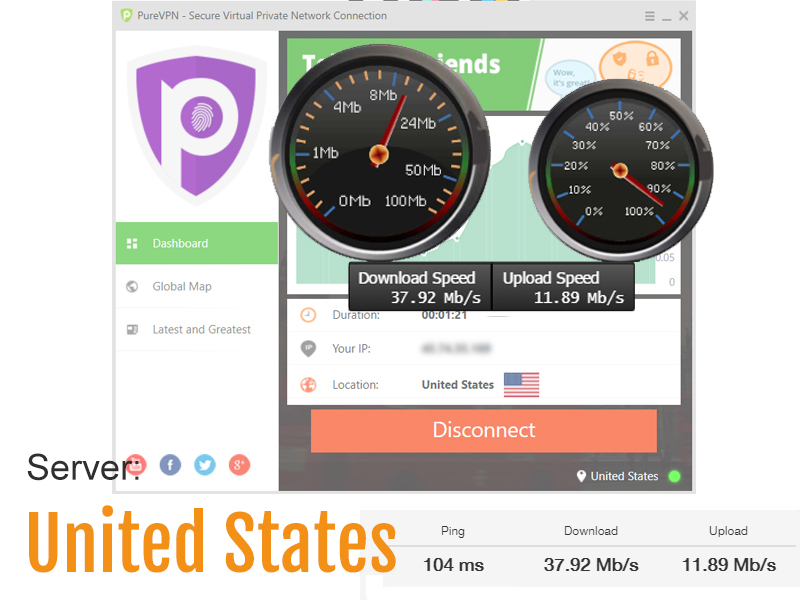 Of course, 'on paper' isn't good enough for our readers, so rest assured that we've put PureVPN to the test! GBP Prices approximate based on current exchange rate. For their basic VPN package, PureVPN offer a nice simple pricing structure with three options - pay monthly, 6-monthly, or yearly. The monthly price of $9.99, while not exactly cheap, is not an unreasonable price to pay if you don't want to commit to a long-term contract. Having said that, PureVPN offer a welcome 7-Day Money-Back Guarantee* on all packages, so if you want to save some big money in the long run, it's worth thinking about going for one of the other deals. The 6-Month option provides a nice 25% discount, but it's a little redundant since for just $11 extra, you can get yourself a whole year's subscription! Whichever payment-schedule you choose, you'll get the same quality of service, with 24/7 support and access to over 500 servers with the ability to connect up to 5 devices at once. This is a seriously attractive package, particularly at the discounted prices on offer. It's worth bearing mind that the basic PureVPN package does not include Dedicated IP, DDOS protection or NAT Firewall - each of these options is available as a paid add-on. At $2.99 - $5.99 per month each, this represents a large extra cost, and there are certainly cheaper options on the market for these services. For most people though, the basic package will be more than sufficient - even without the add-ons this is a high-end VPN service that scores well on value-for-money. • Security Protocols : Every one of PureVPN's 500+ servers offers full support for all current security models. So, whichever server you're connecting to, you can choose from OpenVPN, L2TP/IPSec, PPTP, SSTP, and IKEv2 - ensuring your data stays secure no matter what. • Verified Zero-Logging : PureVPN are one of relatively few providers who guarantee that absolutely no logs of customer usage are kept. Being based in Hong Kong, where there are no mandatory data retention laws, allows PureVPN to provide their service without tracking user information such as websites visited, connection times, downloads etc. While no company is immune to having records subpoenaed in legal proceedings, they obviously cannot provide records they do not hold - a huge plus for anyone seeking an assurance of maximum privacy. • Multiple Payment Options : PureVPN allows users to pay with any of over 150 different payment methods, from standard credit and debit cards, to secure platforms like PayPal and Payza and, best of all, cryptocurrencies like Bitcoin. This gurantees ease-of-use for anyone who is happy to pay with traditional methods, while also offering top-notch privacy for those who prefer to use ultra-anonymous options. • Strong Encryption : PureVPN make use of high-grade 256-bit encryption to protect all data travelling to and from their servers worldwide. There's no such thing as 100% unhackable encryption, but with current technology this VPN provides a practical and secure option that should satisfy any user. • P2P Sharing Support : While some providers discourage or altogether prohibit Peer-to-Peer file sharing on their networks, PureVPN give you the freedom to share as you please provided you use servers in a country where such activity is legal - that gives you over 80 countries to choose from out of the total 141 in which they maintain servers. • Internet Killswitch : This feature is an absolute must for any good VPN provider, and PureVPN are no different. The kill-switch option on the app allows users to instruct the software to automatically disconnect the device from the internet if the VPN connection drops out at any point - ensuring that no unprotected usage occurs. As you can see we haven't found any negatives* to report on PureVPN's security and privacy performance. This is a full-service provider that offers the most up-to-date security features. * We have heard reports of some antivirus/firewall software producing multiple 'false-positives' when connecting through PureVPN, however we were unable to replicate this issue during our own tests of the network. At VPNs.co.uk we speed-test in the UK using high-speed fibre broadband. We test each VPN multiple times on each server to give you a realistic average speed. We also include a baseline test so you can see how the VPN speed compares to our unsecured connection. PureVPN's website makes big claims about providing one of the world's fastest VPN services - and based on our own tests we can confirm that Pure is among the best performers we've seen. Across every server we tested we saw virtually zero reduction in speeds as compared to our baseline tests. We tested for browsing, streaming and P2P sharing (where allowed - P2P is restricted on some servers), and found that even on the highest security settings the connection remained lightning-fast. Finding and connecting to a server is also impressively smooth - none of the waiting around to connect that we've experienced using other VPN applications. With unlimited server-switching this makes location-spoofing a doddle - and we were able to use it to successfully connect and stream from Netflix USA, BBC iPlayer and Spotify as well as many other geo-restricted sites. We did find a reduction to upload speeds on some UK servers we tested. We're not sure what caused this, but it certainly wasn't severe enough to have a major impact on the user experience. We'd love to have some real dirt to dish, but as far as we can tell PureVPN really do live up to their advertising. Perhaps because they own their entire network of servers rather than relying on third parties, this is a well-optimized product that offers speeds to rival any of their more expensive competitors. As you'd expect from a large and well-established provider, PureVPN have spent time and money refining their user software, and the result is a range of well-designed apps for desktop, laptop and smartphone. Installation is quick and easy - the whole process took less than a minute from downloading the software to successfully connecting to a VPN server. On opening the desktop app for the first time, we were offered a range of different modes to choose from. This is an excellent feature for anyone who is new to VPNs - PureVPN have taken the confusion out of choosing protocols and settings. There are modes to optimize your connection for streaming, torrents, or security among others, and switching between these is straightforward. Choosing a server is quick and self-explanatory, and once chosen the connection is established almost instantaneously. One issue we did have was some difficulty in finding servers with support for OpenVPN - as it turns out OpenVPN can't be activated from inside the app. This requires a little extra work to set up manually, but there is a comprehensive tutorial on the PureVPN site, and it only needs to be done once. Likewise, setting up PureVPN directly on a router is quick and painless. This is a great way to extend the already-impressive 5 simultaneous connections allowed - once installed, any device you use on your wifi will be secured. 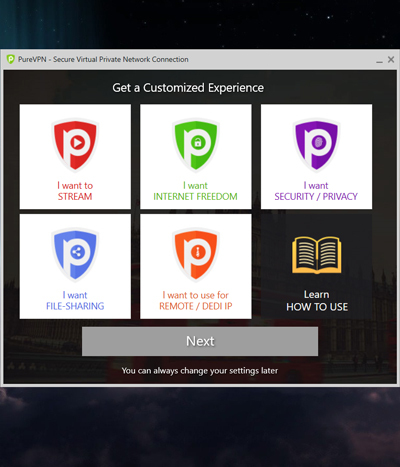 PureVPN also offer support for a wide range of other devices including (but not limited to) X-Box, SmartTV, Raspberry Pi and Blackberry, making this one of the most flexible VPN services in the market. + more, with simple setup on most platforms. PureVPN offer 24/7 live customer support through webchat, as well as a ticket system and an extensive online knowledge base. We think this level of support should be the bare minimum any provider offers, however many do not match up to even this level. Customer service is sometimes not high on the agenda for VPN companies but we have to say that while PureVPN may not be the best we've seen, there are some real positives. We tested the support ticket system and had to wait over 20 hours for a response which did not resolve our issue immediately. However when we tried the live webchat system, we found all the advisors we interacted with to be professional and knowledgeable on the whole - we'd definitely recommend speaking with a live advisor first should you have any problems. Response times are a little slow, but they do get the job done. It would be nice to see PureVPN giving users a telephone support option in the future, but as it stands this is something very few VPN providers offer, so it would be unfair to hold it against them. The online knowledge base has a wealth of answers to frequently asked questions, so if you prefer to try solving a problem yourself, there is a good chance you'll find what you're looking for. PureVPN is one of the most widely-used and best-established VPN brands in the market today. It's no accident that they've kept over a million customers on their books - this is a VPN committed to ever-improving performance and security. By and large they have succeeded in this goal - building a professional-grade VPN network, while charging only mid-range prices. Of course no VPN is perfect and there is always room for improvement. It'd be nice to see features such as NAT Firewall included in the standard package, and though the customer service is pretty efficient, it definitely lacks the personal touch offered by some providers. Overall though, we're very happy to give PureVPN the VPNs.co.uk seal of approval. This is an affordable, secure and speedy network that will match or exceed the requirements of the vast majority of users.